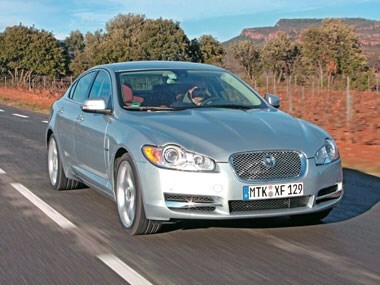 [Mar 2008] I've seen the Jaguar XF at private viewings and motor shows, but it wasn't until I saw one on the open road surrounded by other vehicles that I realised just how contemporary the new Jaguar is compared to immediate rivals that, suddenly, seem to come from a previous design generation. As I slid into the driver's seat I was immediately impressed with the swathes of double stitched leather, contrasting veneers and aluminium trim. It couldn't be mistaken for anything other than a Jaguar yet it's a totally up-to-the-minute interpretation that blends Bang & Olufsen-style minor controls with modern Italian furnishings. Press the starter button and the welcoming theatre begins: the round gear selector rises on a helix from the centre console into the palm of my hand; the vents, until now hidden, swirl on their axis as they open. If it's night then the welcoming blue light flashes around the interior and between the controls. This is probably the coolest car interior on the planet. I sit relatively high in the car with a low fascia giving a commanding view of the road ahead. The steering wheel, inherited from the XK, is thick and chunky in my hands, feeling almost too small for a saloon of this size. I drove three variants on the launch, all with the six-speed auto that has even swifter shifts than the XK. The 2.7-litre V6 diesel delivers 152kW/435Nm and while it might not have the mid-range urge possessed by rival Beemers and Mercs, it's silky smooth and impressively economical as well as being swift. Next up was the 4.2-litre supercharged V8 packing 306kW/560Nm. It is mightily quick, but the supercharger mutes the engine note and I think I'd prefer to wait for the R version when that debuts. Lastly came the normally aspirated version of the V8 with its rumbling exhaust note pouring through the tail pipes as 219kW/411Nm scrabbled for grip on the damp French tarmac. If you can afford the fuel bills this is the one to opt for. The XF is sublimely balanced and feels like a four-seater version of the XK with even better steering and firm, immediately responsive brakes. Drive this car on flowing roads and you'll be grinning like a Cheshire cat, even if the wind noise can be a little intrusive. But let's be generous and say this was down to prototype wind seals. Not only is the XF a great looking car, it has the performance to match. There must be plenty of suits in Dearborn wondering why Ford is selling Jaguar when the XF is about to come good. 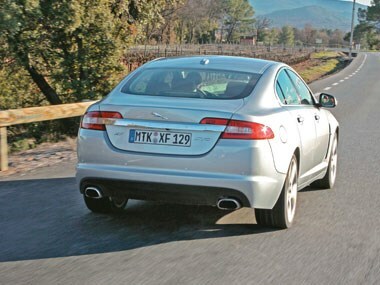 Jaguar's new XF saloon is one of the most eagerly awaited cars for many years. Not just because it's the Big Cat's offering in a market sector dominated by Germany's Big Three - Audi, BMW and Mercedes-Benz and, increasingly challenged by the likes of Lexus and Infiniti - but, because it comes smack bang in the middle of the marque's sale by Ford Motor Company to India's Tata. The XF is based, for monetary reasons, on a vastly updated 'S' platform that's had the the new XK's suspension, steering and brakes grafted to it, as well as powertrains with the addition of a 2.7-litre V6 diesel. Clothing this confection is a bold new style language created by Ian Callum's young team of designers.